Miscanthus, silvergrass, is a genus of African, Eurasian, and Pacific Island plants in the grass family. M. sinensis is widely cultivated as an ornamental plant, and is the source of several cultivars. In Japan, where it is known as susuki (すすき), it is considered an iconic plant of late summer and early autumn. It is mentioned in Man'yōshū (VIII:1538) as one of the seven autumn flowers (aki no nana kusa, 秋の七草). It is used for the eighth month in hanafuda playing cards. It is decorated with bush clover for the Mid-Autumn Festival. Miscanthus has also excellent fiber properties for papermaking. Miscanthus x giganteus (Miscanthus giganteus, Giant Miscanthus)  is a highly productive, rhizomatous C4 perennial grass, originating from Asia. It is a sterile (non-invasive) hybrid of M. sinensis and M. sacchariflorus, and grows to heights of more than 4 meters (12 feet) in one growing season (from the third season onwards). In temperate climates like Europe the dry mass yield is 10-40 tonnes per hectare per year (4-16 tonnes per acre), depending on location. 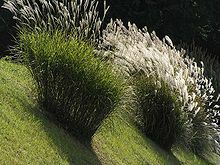 Just like Pennisetum purpureum and Saccharum ravennae (which grow to the same height), it is also called «elephant grass». ^ "Miscanthus". Natural Resources Conservation Service PLANTS Database. USDA. Retrieved 13 July 2015. ^ Andersson, Nils Johan. 1855. Öfversigt af Förhandlingar: Kongl. Svenska Vetenskaps-Akademien 12: 165. ^ Flora of China Vol. 22 Page 581 芒属 mang shu Miscanthus Andersson, Öfvers. Kongl. Vetensk.-Akad. Förh. 12: 165. 1855. - Terravesta - The complete supply chain solution for Miscanthus Europe.